The Metro station Mirabeau on line 10 is a unique and surprising station in Paris. As two other Parisian stations it has a single platform. But the reason why is not the same: it is due to the fact that only the trains towards Gare d’Austerlitz stop at this station. In the opposite direction -Boulogne- there is no stop at Mirabeau… but at Eglise d’Auteuil, 200 meters further. When one is waiting for a train on the platform towards Gare d’Austerlitz, one has the surprise to see the trains going by in the opposite direction without stopping as if they were about to fly! Indeed the track is greatly inclined as the railway tunnel eastwards is much deeper because it goes under the Seine. One can also have a ride in a train towards Boulogne and sit in the first carriage. 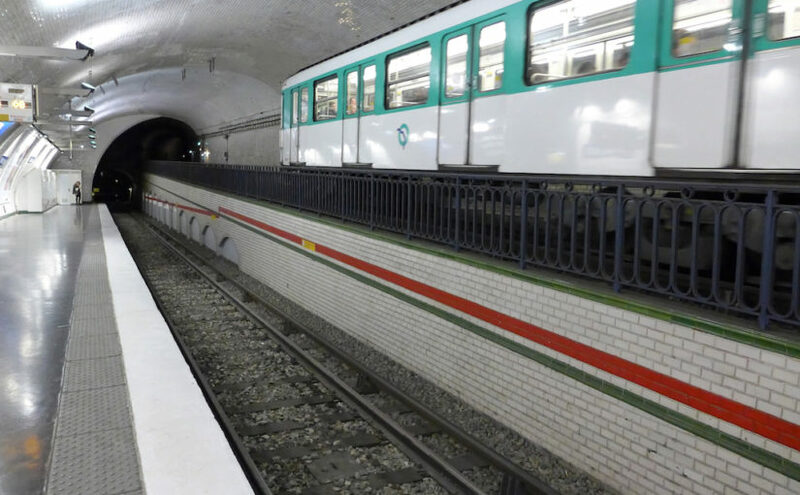 The crossing of the station Mirabeau without stopping is really impressive, especially when the train enters the tunnel at the end of the slope: Do not miss it! The metro line 10 is the less crowded in Paris – except during Roland-Garros tournament- and one can travel to Boulogne and back being seated. Back to earth : The Pont Mirabeau of course, made famous by Guillaume Apollinaire; but also the beautiful Eglise d’Auteuil built in a Roman-Byzantine style. And above all I recommend you to have a walk through the streets and alleys of the former Village of Auteuil: its private houses and Art Deco buildings are really worth the visit! Enjoy!